My loves, to the left you will find French Connection’s stunning Fast Bonny Cotton Dress – the very same one seen hugging the svelte frames of Eva Amurri and Kayla Ewell; on the right take a peek at Charlotte Russe’s sassy Single Shoulder Satin Dress. Though the charming Charlotte Russe piece is constructed out of satin, as opposed to the cozy cotton making up the fabulous French Connection; for $36.50, in comparison to the $172.00 price tag of the French Connection pretty, it is every bit as capable of adding a splash of Old Hollywood Glamour to your wardrobe – at a price that is far more pleasing to one’s bank account! Will French Connection tempt you into being a big spender, or will Charlotte Russe inspire you to save? Thanks to Zappos and Charlotte Russe for the pictures. I like the Charlotte Russe one better... but it may be because the model wears it better. I really like the Satin in the CR version much better!! Even though the FC color is just gorgeous! And nothing wrong with being hooked on "Flirtexting" :) That's what makes you perfectly you! Charlotte Russe for sure! I was shopping there last night and picked up some great accessories that would look great with that dress. I love that you featured a Charlotte Russe item! I haven't been there in ages but now I remember how much and why I love that store. That dress is super cute! I actually, find C.R. much more elegant. ..and cheaper. I really like the cheaper one. I like the CR one much better! This cheaper version looks perfect for those holidays coming up. I like the Charlotet Rusee one, but French Connection is not bad either!! I absolutely love this color blue. It looks amazing on everyone and it's such a fun color to wear. I'd go for the Charlotte Russe dress and maybe splurge on some fabulous shoes! LOVE them both....hard to choose which one. Ooooooh gorgeous find, darling E! I am totally inspired to save! I def like the Charlotte Russe one the best. Does it come in white? I have been looking for a dress like that for my wedding next year. 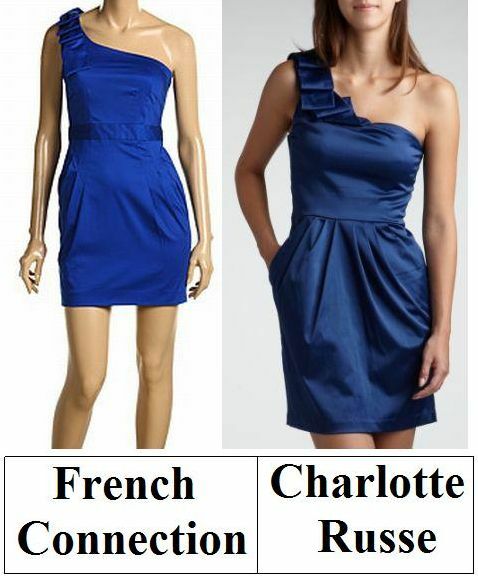 I actually think the Charlotte Russe version looks better, I prefere the shade of blue and am a huuuge fan of satin!! i like the charlotte russe one better. no doubt about it. the color is way cuter!! it's just a bit different!! i actually think the charlotte russe one looks better! How cute! I haven't been to CR in ages! Wow for $36 that Charlotte Russe would make a great bridesmaid dress!! I love the one shoulder. I think I might have inspiration for a post! ;) ITS ALMOST THE WEEKEND!!! I love the color of the Charlotte Russe version better. Thrifty, all the way. Call me crazy, but I like the Charlotte Russe one better. I might even try a think little belt with it...sassy shoes a must! I always love the styles you find for your Thursday posts! This one tempts the shopper in me. I love the style. And the price for the Charlotte Russe? Perfection! Incredible price. What a steal. I prefer the color of the French Connection dress... but who knows if it is like that in person! ps - my comments were broken before, but I got them fixed! I think I like the CR version better! I like the satin, but the color in the french connection is beautiful! Thank you for your sweet blog comments! We were only in Brooklyn briefly to see the bridge, but it seemed awesome and Williamsburg is on my list for next time! I personally find the CR more appealing- but both offer such a gorgeous, flattering shape. 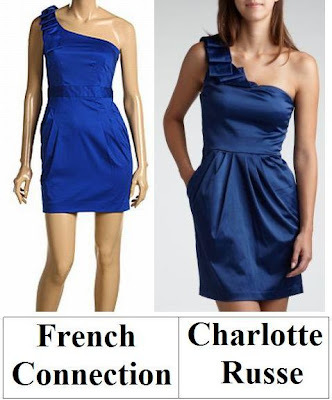 i like the charlotte russe better, the french connection one looks a bit cheap. wow, i wonder if CR was inspired by that dress because they look so similar?! Wow, I'm so glad the cheaper one is so pretty. Cool. I heart the French Connection one -- I'm always drawn to cotton cocktail dresses over jersey or satin. Hmm I like the Charlotte Russe better, it has some prettier details to it that the French Connection one is lacking; however the FCUK dress' color is better. Despite the color, I actually like the Charlotte Russe one better! I'll have to check the dress out next time I'm there. The CR dress looks gorgeous! I prefer it and its cheaper too. Just accessorize and voila! you are a queen. Love this so much. The color is amazing. But alas, I have nowhere to wear this lovely frock! I love the Charlotte Russe dress and at a glance I thought it was the expensive one! Oh, that's GORGEOUS! Love, love, love the color blue! Now, on most occassions I would go for the cheaper versions you display. This time however, I must stray. French Connection is one of my fave. place to go for cute affordable dresses (Because I can't afford BCBG dresses) So I'm gonna go with French Connection on this one! Charolette Russe can really do some amazing pieces! Their quality is a little "meh" but some of my favorite things come from there! Yes please to the satin affordable dress! NO WAY!! I'm pretty sure that my friend most definitely has that dress! Charlotte Russe, definitely. But I really love the single shoulder on both! I Luv the colurs of blue in those dresses, Cafe Fash! Never heard of Cambria Cove - is that in Cambria on the coast? why is it that the cheaper version almost always look better than the more expensive one? haha. Always, always the cheaper one... doesn't mean it is CHEAP as such but still... you will have money left over for the shoes!! Hello hunnie...I have alot of pieces from CH......this one is great!!! I actually like the Charlotte one better. I hope this finds you doing well. Enjoy the weekend. I actually like the Charlotte Russe version much better. The color is gorgeous! oooh I surprisingly like the russe one better! love love love the charlotte russe dress! i like both of them, but i'd probably go with the CR dress because of the more affordable price. I am so obsessed with one shouldered dresses right now! I actually like the cheaper version in this case! The Charlotte Russe dresses looks fabulous! The color is gorgeous too. I love this post because I never seen this brand before. After I saw your post, I clicked on the Charlotte website. There are many gorgeous dresses that I want to buy it. You’re very fashionable. Thanks again! These blues are such a perfect colour. I really love the Charlotte Russe ones. It's so lovely. I think I'll be among the minority here - I actually like the color of the French Connection dress better! I think the cut of the Charlotte Russe dress is nicer though - the FC dress has a weird waistband bit that I don't like.